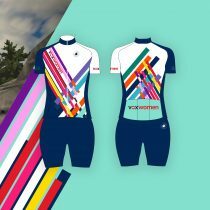 Get ready for the inaugural VoxTour, a 5 stage women’s tour designed by the Voxwomen ambassadors. They are Olympians, pros, ex-pros, sports commentators, and entrepreneurs whose mission is to inspire and motivate women who ride. Each stage has a story because a Voxwomen ambassador curated each stage, inspired by their own cycling experience. Learn more about the Voxwomen ambassadors and the story behind their stage. Hardly. The VoxTour is comprised of 5 unique stages that will challenge you in different ways. Some riders may push the pace, others may be more casual. It’s about finding your pack and sharing the experience. The VoxTour is an opportunity to learn more about the remarkable women of cycling while pushing yourself. Voxwomen puts you at the heart of women’s cycling where content is queen. Get ready for insightful content direct from the teams, riders, brands, and events. The team at Voxwomen sneak you behind the scenes of one of the most beautiful sports in the world. Tune in for blogs from the top riders in the world tour peloton, including our own Zwift Academy Champions, a twice-monthly podcast that’s rich with eye-opening analysis, and race action from all the major world tour races. Voxwomen is your gateway to all of this and more. I R I S is an acronym for I Ride In Style. Founded by ex-professional cyclist and designer Iris Slappendel. A design student, Iris always integrated design work into her off-the-bike career. She’s designed bicycles, websites, and bike kits, most famously for the Dutch 2016 Olympic cycling team, and the UCI’s Road World Cup leaders’ jerseys. Iris raced as a pro all over the world, from 2004 until 2016. She competed in multiple World Championships and won the Dutch National Championships in 2014. The events are listed below. Click on any event to sign up.